The author has written a superb review on the toxicology of numerous poisons that in general are not readily obvious. These include for example, arsenic, hemlock, scorpion venoms, plants, poisons that are associated with sea habitants, spiders, and snakes. Each chapter reviews in detail the differences in poisoning by these species. Finally, for those with a scientific background the author provides an excellent review of a potpourri of agents which can be toxic depending on the dose ingested or administered, and as the author points out in chapter 1, in the words of Paracelsus, “the dose makes the poison”. In the chapter on a potpourri of poisons the author discusses these chemical agents in detail including their mechanism of action. These include several drugs used clinically, such as opioids for pain, statins for treating hypercholesterolemia, doxorubicin for the treatment of cancer, curare, a muscle relaxant but which has been replaced by newer agents, warfarin an anticoagulant, the various alcohols, and carbon monoxide which is responsible for many emergency room visits. Finally, oxygen toxicity which may surprise many readers is discussed in detail as this has been the author’s area of research interest for decades. This last chapter entitled “a potpourri of poisons” will most likely require a background in chemistry and biology. This should not deter non-scientists from reading this book. In case of anything, it may convince non-scientists to consider a career change. The greatest strength of this book is that the author has provided one source a detailed compendium of appropriate internet references which allows the reader to obtain further knowledge on that specific poison. The book targets an audience that is generally interested in toxicology but not necessarily requiring a detailed background in the basic sciences, although some exposure to chemistry and biology would be helpful. This is a good book to have in home, particularly regarding the discussion of poisonous plants, aquatic species, spiders, and snakes. This should also be a good reference source for those working in state and federal national parks. The book is well-written and easy to read by a non-scientist, except for the last chapter, a potpourri of poisons which does require knowledge in chemistry and biochemistry. The book has a wealth of useful information. The book should also serve as a useful text for undergraduate toxicology programs. The author’s inclusion in several chapters of his own personal exposure to some of these potential poisons during his adolescent years provides a feeling to the reader of being there. The figures presented compliment the text and make the reading interesting and the readers desire to read more. The real strength of this book, however, is the remarkable extensive referencing provided by the author. He has produced a text with all of these references in one place for easy access for further readings. Well done Dr. Olen Brown. I hope to entice the scientist and other readers of this book in equal measure. Poisons have two stories to tell. The science of poisons deals with the chemistry of toxic agents and the way they work at the cellular and molecular level. 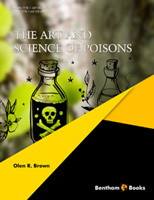 The art of poisons encompasses everything else about these agents that congers up the image of the skull and crossbones. The science of poisons takes us on a voyage into the sub-microscopic world of atoms, molecules, and cells. Only there can we see the true miracles and mysteries of life and death. The mere existence of poisonous substances and especially the uses made of them by plants and animals are wondrous. Poisons are also used to explore the biological mechanisms of the body, to lower cholesterol by blocking its synthesis, to kill cancer cells, to destroy pests of all kinds, and as weapons of war. Science is neither moral nor amoral, only its uses can be so characterized. The art of poisons encompasses everything else about poisons. It is the legends and stories of intrigue and murder and other deeply deplorable uses of toxic agents often with a surreptitious and evil intent. Let us hope that the future extends the beneficial applications of poisons and quells their evil uses. A traditional, central concept in toxicology can be stated simply: the lethal dose of a substance is the amount required to kill the average person (the LD50). Today for most poisons, the mechanism of how they kill is known at the molecular level. Therefore, I propose that a new measure of toxicity based on the number of molecules required to kill (the LD50*) is appropriate. The simplest summary idea about poisons is one of the oldest ̶ the dose makes the poisons (paraphrased from Paracelcus). I believe the most extreme example is the toxicity of oxygen. Oxygen is essential; we cannot live more than a few minutes without oxygen; however, it is detectably toxic at approximately two times the concentration found in air, and at hyperbaric pressures it is lethal. This book was written out of my experiences gained through scientific study, experimentation, and life. I was aided by the many individuals in my laboratory and the students I was privileged to instruct at the University of Missouri. I also thank my students and professors at the University of Oklahoma where I learned a deeper appreciation for science. I thank them all with deep gratitude borne out of experiencing the grace brought by science and discovery. I especially thank Claire Engler and John Allen for Art work illustrating concepts in the book and Cameron Brown for invaluable assistance with preparation of the manuscript and computer formatting.